Going back to the buttered baguette “soldiers” we used to dip in soft-boiled eggs when I was a child, I have always been fascinated by bread as a container or as silverware. I may yet make a “pain tranchoir”, a slab of bread on which medieval ladies and lords heaped their meat as the valets made their way around the great halls with chunks of roasted animals on huge platters. The bread would slowly absorb the dripping juices and since the mighty only ate the meat itself (which they cut with a knife close to their mouths), it was distributed to the poor (or sometimes sold to them by the servants) the day after, nourishing and flavorful. Maybe I’ll try that over the summer. Mighty Man can have the steak and, as I’d pick bread over meat any time, I’ll have the humble tranchoir. 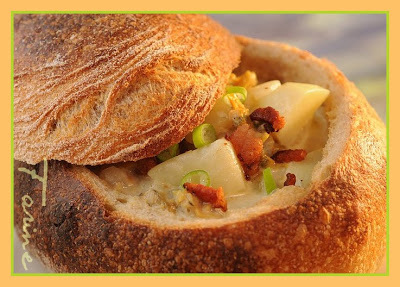 In the meantime, I like the idea of making bread bowls as vessels for soups (here a New England clam chowder), salads, chilis, appetizers, side-dishes, etc. (for some suggestions, check out The Sourdough Bread Bowl Cookbook, by John Vrattos and Lisa Messinger). This time (I made the dish for the first time last year, using baguette dough, and posted about it here on my French blog) I made the bowls out of the same batch of dough as the rustic batard. The dough was a tad too wet (85 %) for the purpose. If you make the dough specifically for the bowls, you may want to go for a lower hydration rate (maybe 70-72 %) as it will make it shaping easier. However I was more or less able to reproduce the technique that Gérard demonstrated for me on a piece of his firm levain (a much less hydrated piece of dough) last time I visited. Gérard says that we are going to let the dough rest a few minutes and that he made one a bit bigger as the other. Gérard says the shaping is the same as for a brioche, the idea being to embed the top (or head) in the main ball. During the proofing, the dough will rise in a pear-shape (or cone). No scoring is necessary if the top is well buried in the main part as the base will widen a bit and get more stable. The lid is cut out after the baking. 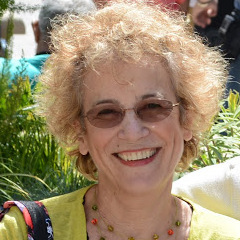 Gérard offered a further tip, which is to melt some butter and after scooping out as much of the crumb as possible, to use a brush to gently (and sparingly) “paint” the inside of the bowl with it. The bowl is then put in the hot oven for about 5 minutes until nice and crisp inside. For last night’s soup, I got my inspiration from Barbara Kafka’s recipe for clam chowder in Soup – A way of life, which I adapted somewhat. For instance I used canned minced clams and bottled clam juice instead of fresh clams which I would have had to scrub and cook myself. I also added a tiny bit of bacon (about 1 strip, chopped in tiny pieces and cooked separately until crisp). Carefully pour into the bowls, garnish with chopped scallion and bacon bits. Bon appétit! The bread bowls go to Susan, from Wild Yeast for Yeastpotting. That's a tasty looking bread bowl and soup. Yummy! Interesting shaping technique — I'm familiar with it for brioche a tete (the bane of my shaping existence) but never thought of it for bowls. The soup in the bowl looks beautiful and delicious! @Susan, I am positive your brioches are the best! I like the shaping technique. 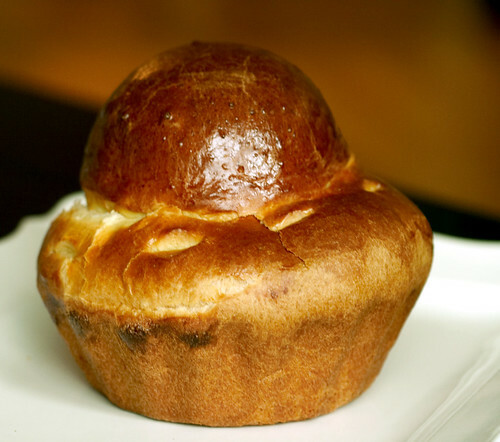 This is a really nice idea to shape it like a brioche a tete. Thank you for great explanation…have always loved idea of bread bowl but never knew how to shape properly. The chowder recipe is wonderful, too! @Mamatkamal, would there be a Moroccan version which could be used to serve a tajine? Or would that be a complete cultural and gastronomic absurdity? @Stefanie, Gérard is the one who introduced me to the idea. It had never occurred to me to do it that way before. I must way it works just fine, although it'd probably have been a bit easier with a somewhat firmer dough. Is the idea of the shaping to provide a handle on the top? I'm not familiar with the brioche form you mention. It looks like a wonderful vessel for my clam chowder.